Had Warhol been British, he might well have said the same thing of tea. Granted, a milky brew in a greasy spoon isn’t quite the same thing as high tea in Windsor Castle – unlike coke, not all tea is created equal – still, the analogy stands in that tea has become, in the UK at least, something of a common denominator, a cultural leveller in a society that is still plagued with notions of class: after all, everyone likes a cup of tea (and those heathens that don’t may show themselves the door). It’s easy to trivialise the British recourse to hot drinks as a cure-all – and that’s another thing we love to do: to parody our ludicrous love of tea, much as we do our preoccupation with the weather – but it speaks to a welcoming spirit of open hearth and home that seems more important than ever at a time when closed-mindedness tells us to shut the door on those more hard-pressed than ourselves. In ancient Greek culture, hospitality was thought a sacred obligation, a two-way relationship in which host and guest were bound through mutual respect. So important were its codes, that it was a bond overseen and guaranteed by almighty Zeus, father of the gods. Though I’d like to think we have a somewhat more relaxed attitude to hosting, its fundamental values of kindness, generosity, and compassion are – like a good cuppa – to be treasured. So, to tea, and what to serve it in. 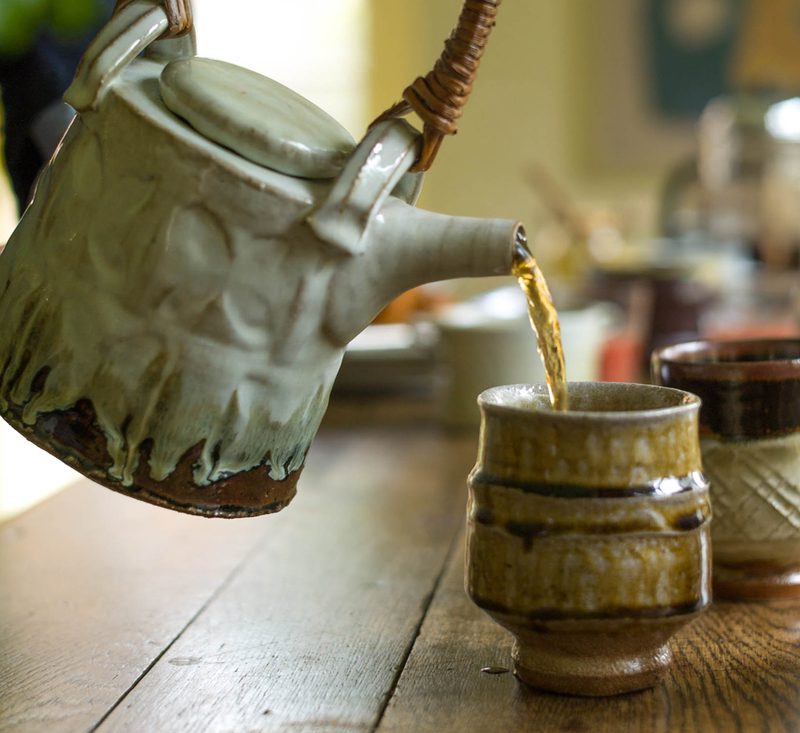 Of the many handmade ceramic forms that can enrich one’s day-to-day life, few are as simultaneously humble and enhancing as a handmade mug for tea. At last count, there were more than thirty in my own cupboards, over half of them by one potter alone (the brilliant Anne Mette Hjortshøj, in case you were wondering). Despite seeming an absurd number to own, I have found that, without consciously trying, each and every one is nonetheless used on a regular basis. There is a simple joy in the daily rotation from cup to cup; slight variations in the pull of a handle that settle the vessel in the nook of a finger, or the crest of a lip that matches your own. Even the subtlest changes affect the way I might nestle the mug into my left hand: one day a cup nurtures and warms, begs to be cradled; the next, a new arrival demands posture and attention, a stiff brew to blow away the cobwebs of a restless night. 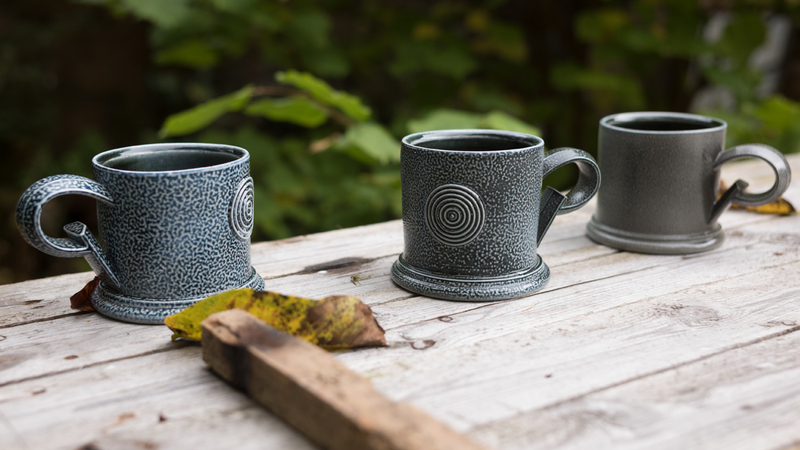 With time, certain cups seem even to change the very taste of the tea – something even those who do not use handmade pottery can attest to, when drinking from a favourite mug. If hand-thrown cups bring a kind of gentle satisfaction to the daily routine of morning and afternoon tea, a handmade teapot elevates those moments to something deliciously special. Teapots are a favourite among potters: their assembled components, from handle to spout, lid, and body, offer endless reinvention and combination, a sense of creative scope that makers like Walter Keeler have particularly singled out. Something of their subsequent peculiarity – their unique arrangement of assorted elements – lends their use a wonderful feeling of occasion (even if the occasion is just a pot for two on a rainy afternoon). For their makers, they can also be a source of eternal frustration: the teapot requires not just throwing aptitude but an understanding of physics, a balancing of weights and angles that allow boiling hot water to pour with ease and without spattering over an unsuspecting user. It is a delicacy of engineering that even most industrially produced teapots lack; to find a good ‘pourer’ is a rarity, a sign of true craftsmanship. Tea and fine ceramics have gone hand-in-hand ever since they first arrived on our shores some four hundred years ago, the Chinese leaves packed tightly into the imported teapots that so informed our development of form in British pottery throughout the centuries that followed. They remain one of the most accessible luxuries available to us – with the company of a friend, we could do worse than to indulge in it.